A national distributor invited us to call on a hardwood lumber manufacturer located in South Central, Pennsylvania. The manufacturer was researching a low cost printing solution which would eliminate the need for hand applied end tags on lumber. End tags are labor intensive to apply and could be easily removed. Due to this manual process, the production line did not run at full speed. Loveshaw poerformed an onsite demonstration of the HRP MicroJet. We attached the unit to the manufacturer’s existing conveyor system. The lumber absorbed the quick drying porous ink perfectly. The numeric code was crisp and easy to read. The lumber manufacturer ordered their first HRP immediately after the demo. Within a month, the manufacturer identified additional opportunities for the HRP and purchased an additional five units. 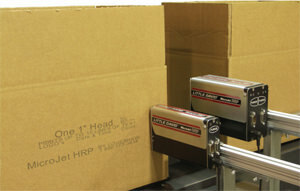 Reducing labors costs by 100% - Eliminated the need to have an operator stationed to manually apply end tags. 1" Printhead prints: 1/10", 1/4", 1/2", 3/4", 1" tall or 10 lines at .10"